A year ago, I did a fundraiser for the Bloomington Playwrights Project, called The Playoffs. As an incentive to donors, I offered to design and build rockets for anyone who donated in my name. Longtime blog readers may remember a rocket I built, originally called "Keith's Rocket," then renamed the Copperhead. I liked the results so much, I'm now building one for myself. I gave the rocket to Keith, but then moved to Boston, so I never got to see it fly... until he sent me the video. So exciting to see one of your own designs get launched! I designed this rocket with only about six months' experience as a rocketeer. Even if you're a rocket n00b, you can design and build your own rockets, and sometimes you come up with something really cool. I can't wait to finish mine. I've even decided to add a booster, making it a two-stage rocket. Like my Facebook page for blog updates, pictures of current projects, and extra stuff. In most of my blog posts, I put a little note with a link to my Facebook page. I'm currently adding lots of photos and stuff to the Facebook page, including a launch photos album and a current projects photos album. If you "like" the Facebook page, you can get updates on your newsfeed. Of course, not everybody does Facebook, so I'll eventually add a current projects page to this blog (blogger.com differentiates between blog posts, such as this one, which show up in reverse chronological order, and pages, to which you have to post a link). And build series will still be a part of the blog, as long as they have something informative for n00bs. This nice, big model rocket is one I've had my eye on for some time now, and finally got one. With three, elliptical fins and a conical boat tail, at the aft end, it's meant to be a high-performance design. A boat tail may reduce aerodynamic base drag (if it's fit correctly), and elliptical fins, if properly airfoiled, may also help reduce induced drag, which is caused by the fins correcting the trajectory of the rocket in flight. But I like it because the shape is different from rockets I've built in the past, and it's a long rocket which takes a long-burning E9 motor. Filling in the seams on the plastic parts is important for a nice finish. Long-time blog readers know I like to shape my fins. In particular, I love to sand fins into airfoils. This takes some practice, but isn't too hard to do on most fins, with a straight leading and trailing edge. But on elliptical fins, I was worried it would be impossible to get right. So I cut some copies from scrap balsa, and gave it a go. Turns out not to be so impossible after all, if you've had a little practice shaping things with your sanding block. After I cut a few more scrap fins and figure out exactly what I want them to look like, I'll have a go at the kit fins - and use the scrap fins to make a bunch of clones. I have a ton of Astron Sprint XL nose and tail cones, because of a huge purchasing debacle I'll tell you about another time. This is a classic Estes kit which disappeared years ago. Semroc brought out a clone in more recent years, and Estes finally re-released it. It's smaller than I had imagined, but a cool little rocket which flies on those fat, 24mm D motors - which will take it pretty high! But I came up with a decent fix. Both of these will become blog posts. 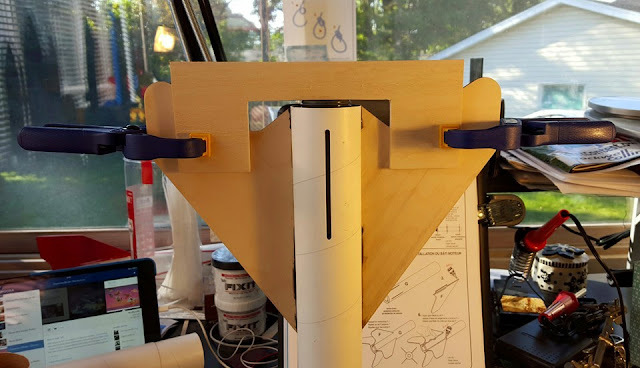 A rocket cradle is a useful, easy-to-build tool, and I already started a series on the Estes Pro Series II Nike Smoke, which is nearing completion. I have discovered a few things for the inexperienced builder to watch out for when building this rocket. At least, they're things I wish I had known when I started! Today in the mail, I got a large, 2.6 inch diameter nose cone, which fits a BT80-sized tube. This is so that I can build a clone of the Estes Optima, a large Estes model from the early 1990's. I'm excited about this one. It's a simple rocket to clone, but I think it's beautiful. And with a rocket so large, you can put one of those long-burning Estes E9 motors in it, yet it won't go so high you'll lose the rocket! Like my Facebook page for blog updates, pictures, and extra stuff! Got Cool Rocket Pics? Submit Them to the Calendar! The Rocketry Forum is accepting calendar submissions through tomorrow, October 18. If you have some cool rocket pictures, submit them here. A lot of pictures on this thread are high power pictures, but model rocketry should also be included, so if you have them, submit them! Your post must be "seconded" by another user. Get those cool pictures up there and achieve rocket immortality! I just found a video I love. This guy gets a launch set with two ready-to-fly rockets. He unboxes them, then goes out to launch. What an awesome birthday present - and one I'm guessing he wasn't expecting. I love this guy's enthusiasm - and the fact that he follows the directions! I just love it when someone discovers rocketry for the first time. This post is about a current project I'm working on. Pictures of current projects will mostly appear on The Rocket N00b Facebook page, so I can focus the blog more on informative stuff for beginning rocketeers. But I think this post has some information for rocket n00bs, so here it is. Check out the Facebook page for more rocket pictures, blog updates, and links to cool stuff. A few months back, I designed and created a little model rocket as a thank-you for a donor to a fundraiser I was doing for the Bloomington Playwrights Project. It's called The Copperhead. Once I'd built the rocket, I really loved it, but never got to see it fly. I decided to build one for myself. Last night, while working on about seven other rockets, I just started working on it. The rocket has forward-swept fins and a small payload section. Look closely at the payload section - the fat upper part of the rocket. There are four tiny holes drilled into the side. That will allow me to use a barometric altimeter in the rocket, so that I can track how high it goes. While the rocket looks really cool, it's always surprising to see how they come together. The parts alone don't look like much. A few standard-sized tubes, a sheet of basswood, and a nose cone purchased online look kind of humble when you first begin building a rocket. The parts can come together quickly, though, and before you know it, you have a pretty great-looking rocket. The first motor launches the rocket into the air. When the propellant is burned up, it ignites the motor inside the upper stage, and the booster is jettisoned and tumbles back to Earth. Adding a stage to a rocket can boost its altitude - and its velocity - dramatically. Instead of launching the main part of the rocket - called the sustainer when it's part of a multistage rocket - from the ground, you're basically launching it from high in the air, already moving upwards. The results can be spectacular. Adding a booster to my Copperhead rocket will take its peak altitude of 740 feet up to over 1300 feet - nearly double! 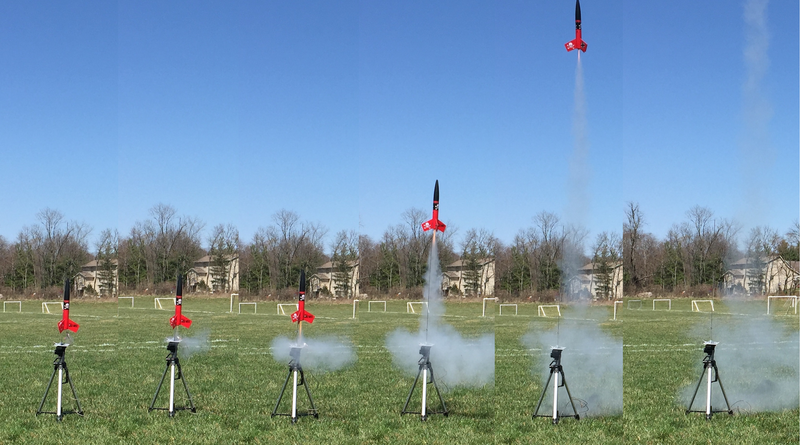 If you understand the basics of rocket stability and model rocket staging, you could probably build a booster for just about any model rocket, adding altitude and speed. Imagine making that fat, heavy Big Bertha into a high-flyer! But beware, this increases the likelihood of losing the rocket! When launching a multistage rocket, you need a larger field, and may need to put less powerful motors in it. But building a booster requires only a few extra parts, some knowledge of the staging process, and a little modification and care in building the rocket. I'll cover staging here more extensively in the future. The brown tube in the right is a tube coupler. I'll only need a 1-inch length of it. The motor mounts are already installed in the main body tube and the booster body tube. Still looks like a pretty humble pile of parts, doesn't it? That's one of the many cool things about rocketry. You start with some simple paper and plastic bits, and end up with an astonishing flying machine. I like the forward-swept fins on this rocket, and with a booster in place, it will look even better. 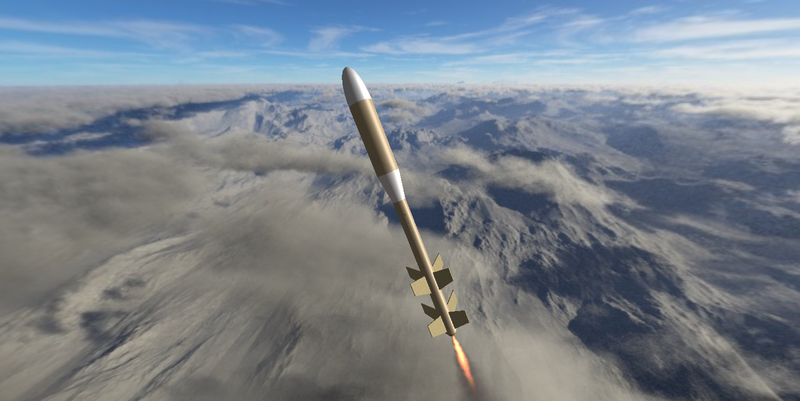 OpenRocket allows you to create a kind of "artist's conception" of what the final rocket will look like in flight. I can't wait to do a test flight! You have a basic Skill Level 1 rocket kit or two, and want to get started in rocketry. But to build rockets, you're going to need a few tools. Where to start? 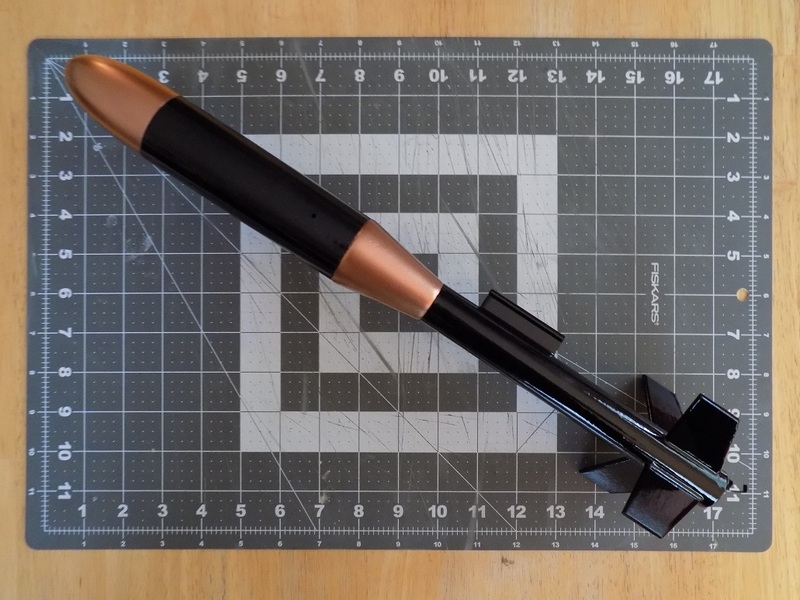 Do you need to go nuts at the hobby shop and hardware store just to build your first rockets? Of course not. Starting out in rocketry requires relatively little, and you can add more tools as you decide you need them. So here are some of the tools you'll need. There are the basics, which you'll need for just about any rocket, then a few things that are nice to have. There's probably no limit to the number and assortment of tools which have been applied to rocketry, but you can acquire things as you go, if you get into more advanced building. Actually, you could probably classify the items in this post into two categories: tools, which you'll use over and over again, and materials, consumable items which you'll use on each rocket, and which you will have to replace. Some tools you have to buy, but in rocketry, often you see people using improvised tools. Rocket building encourages and rewards creative problem solving! As you'll see, the tools and materials for the rocketry beginner are very affordable, even if you're on a tight budget. Here are the indispensible tools and materials you'll need just to begin. You'll use this to make marks on the body of the rocket to help you place the fins on accurately, and to mark off measurements. If you want to start using some more advanced techniques, like, say, sanding rocket fins into a "teardrop" or airfoil shape, you'll use the pencil to make marks on the fins. Always use a pencil. Never use a pen or marker to make these kinds of marks on a rocket, because the ink will bleed through the paint. You can measure things with a wooden or plastic ruler, but often you use the ruler to guide cuts that you make with a hobby knife. The metal ruler won't get marred by the knife. You should get a ruler with a cork backing. This will help keep the ruler from slipping. I started with a six-inch ruler, seen in the photo above, but quickly realized I needed a longer one, so I bought the 12-inch ruler. I should have just gotten an 18-inch ruler to start with. Get at least a 12-inch ruler if you can. You might know this as an "X-Acto" knife. X-Acto is the Kleenex of hobby knives, in that it's so ubiquitous people often refer to the tool by the brand name. But you can find cheaper ones. The hobby knife has a chuck into which you can insert a number of disposable blades. The blade you'll use most often is the #11 blade. I have several hobby knives. One interesting one is from Fiskars. This is a kind of precision hobby knife, which uses the same blades as a standard hobby knife. The difference is in how you hold it. Instead of holding it like a pencil, you put your index finger through the loop, giving you more control over the knife. While I like the design of this hobby knife, I have to admit I haven't used it all that much. Another option for cutting, recommended by Chris Michielssen of the Model Rocket Building blog, is the kind of box cutter with breakable blades. When the blade gets dull, you break off a section and you have a new blade right there. They're pretty economical, and work well for all but the fiddliest, precision cutting. My cutting mat is the background to a lot of the pictures on this blog. What many rocketeers use is what's known as a self-healing cutting mat. You can find them at craft stores, hobby stores and fabric stores. Olfa is a popular, prominent brand, but mine is from Fiskars. They're pretty much the same, except for the color - and the price. A self-healing mat can cost $20-$40. But I got mine for about $14 from Michael's Crafts with a 40% off coupon. I started out just using newspaper as a cutting mat. If you use a thick pile of newspaper, say, a whole Sunday New York Times, that will work. Just be careful not to cut through it into the table. A cutting mat is a better option. If you're on a budget - or in a hurry - check out the dollar store. When I was about to teach a model rocketry camp this summer, I got a 3-pack of flexible cutting boards for a dollar. They may not look as fancy or last as long, but they're cheap, and they should do the trick. You don't have to buy a sanding block. You can simply make one. A short length of 2X4 wood, or anything that's perfectly flat, rectangular, and be easily held in the hand will work. You just wrap a length of sandpaper around it, and you're ready to sand. Or, you can get a sanding block from a hardware store. However, I highly recommend the Great Planes hand sander, seen above. Since I first bought one after learning about it from Chris Michielssen's blog, it has become my absolute favorite tool to use. It's so simple, comfortable to use, lightweight, and perfectly flat. You simply use spray adhesive to attach any grit of sandpaper to its surface, or you can buy sandpaper with an adhesive backing already applied. At under $8 on Amazon, I love this tool so much, I've ordered a second one. That way, I can have two different grits of sandpaper ready to go without having to change sheets each time I need a coarser or finer grit. I almost didn't include this in the Indispensable Tools for a Beginner section, but they're so useful and cheap, I think you need to have them. Dowel rods and craft sticks are useful for many applications in rocket building. But the thing that makes them indispensable, even for the beginning rocketeer, is that they're necessary for getting glue into hard to reach locations, such as up inside a rocket body tube or motor tube. For doing that, I prefer skinny dowel rods, about 1/4 or 1/8 inch in diameter. But dowel rods are useful for so many things. Here's what I'd call "improvised tools," consisting of dowel rods with expended rocket motor casings attached to the ends. These are painting wands. You insert the expended motor casings into the rocket just as you would a rocket motor. Then you can hold the wand and spray paint the rocket without touching it - very important if you want to get a nice finish on the rocket, and minimize the amount of paint you get on your hands! For an Absolute Beginner Rocket N00b toolbox, that's all you need. There are a lot more things you'll probably want, but that will get the rocket built. These are things you'll use on each rocket, but they're not reusable. You will run out and need to replace them. There are two main types of glue you might use in basic rocket building, and they're frequently referred to as yellow glue and white glue. Yellow glue, which is technically known as aliphatic resin, is more commonly called wood glue or carpenter's glue. You can see my particular brand on the left. White glue, also known as polyvinyl acetate, or PVA, is so called because it's white in color. Either of these works well. I happen to prefer wood glue, but that's just a personal choice. What you absolutely do not want to use to build rockets is "school glue" or anything washable. Washable glues are not strong enough, and a little moisture can ruin your rocket. Some beginner's-level rockets require you to glue plastic parts together, or to glue plastic to a paper body tube. In that case, you may need some plastic cement. This stuff actually melts the plastic so that it bonds with other parts more easily. It's nasty stuff, but sometimes necessary. To get started, you'll probably only need two grits of sandpaper. The higher the number, the finer the grit, and the smoother you can sand something. But, of course, sometimes you need a coarse grit of sandpaper if you're trying to remove material and sand something down, rather than just make the surface smooth. For a beginner, 220 grit and 400 grit will be what you need. You can experiment with coarser and finer grits of sandpaper - say, 100 grit for a tough job that requires sanding something off, or 600 or 800 grit for getting a really smooth surface. But for most applications, these two will work great. Technically, these are optional. You can fly your rocket without painting it. But most people choose to pain their rockets, and you probably do too. You have a lot of options here. The main thing is to make sure your primer is sandable. You can either go with a primer called "sandable primer," or with something called "filler primer," which is not only sandable, but also helps fill in imperfections in the rocket's surface. Primer is basically "the paint you paint before you paint." It helps the actual paint to adhere to the surface, and using a sandable primer means you can get a really smooth surface for the paint to adhere to. This will help you get a smoother, nicer-looking (and better-performing) rocket. There are a lot of different spray paints you could go with, but a couple of tips for the beginner: stick with the same brand and line of paint for each color you use (Rust-Oleum 2X enamel paint, for example); start with the lighter color first, and do the darker colors over that; don't mix kinds of paint, e.g. lacquer and enamel. That's it. That's your beginning rocketry tool box. There are a ton of other tools and materials you might use as you get more into rocketry. For the beginner, the following are a few things it's nice to have, but aren't strictly necessary. Aluminum angle, or "angle iron"
This is one of those improvised tools used by a lot of rocketeers. It's a piece of aluminum that has two sides at a 90 degree angle. You find it in 3 foot long sections in the hardware store, often near the steel rods (which you can use to build launch pads!). I have no idea what they're really supposed to be used for - making doors, maybe? Or windows? But they're used in rocketry a lot. With a piece of aluminum angle, you can draw a line straight up the side of a body tube, because the angle will sit perfectly on the tube. so that it could double as a rough kind of ruler. Traditionally, rocketeers used a door jamb or the edge of a drawer to draw straight lines on a rocket airframe, but this technique has drawbacks. Those drawbacks include marking up the door frames of your house with pencil, and getting lines on your rocket which are not perfectly straight, due to imperfections in the door frame or drawer edge. A small, 1/2 inch aluminum angle may serve all your needs. You can get a larger one when you build larger diameter rockets, but a small one may serve as well. They're pretty inexpensive. Much like a hobby knife, this is a handle with a chuck on the end. The blades are replaceable. It's a very thin saw for cutting things like wood or plastic. I held off getting one of these for a while, but I find it very useful. There are several basic rockets which might be easier to build if you have one of these. For example, if you get the Estes Tandem-X launch kit, which has a launch pad, launch controller, and two rockets, one of the rockets you'll have is the Estes Crossfire ISX - a great little high-flying rocket. When you build it, you will have to cut the nose cone into a few pieces - the nose cone itself, plus a "nozzle" for the aft end of the rocket. The kit instructions suggest using a hobby knife for this. You could use a hobby knife or utility knife, but it would take quite a long time. You might be tempted to press really hard, and risk cutting yourself, or damaging the parts, or breaking the hobby knife blade. You could also use a utility knife, which would take a bit less time, but still require some work. A razor saw makes short work of cutting plastic parts like those. I used a hacksaw when I built my Crossfire ISX. Overkill, perhaps, but I didn't have the patience to use a hobby knife safely, and didn't have a razor saw in my toolbox yet. This required lots of sanding, not to mention borrowing a hacksaw, as I didn't have one of those either. Now that I have a razor saw, I use it all the time. I've even used it to build other tools. There are lots of other tools, materials, and techniques you'll adopt as you advance in rocketry. Some of these will be to make your rockets look or fly better, and some of them will be because you'll use sturdier materials as you build bigger, more powerful rockets. But if you're just starting out, this tool box will serve you well, and you'll use all these tools for many rocket builds to come. In an upcoming post, we'll see some more tools and materials you may want to consider, to make rocket building easier, and to make your rockets look even better.